Please set your monitor gamma to 2.3 or thereabouts. Otherwise the pictures will look dark and ugly. If they're ugly but not dark, your gamma is ok.
Photorealistic RenderMan now supports a new surface type, RiBlobby, to render blobby implicit surfaces in the style of Blinn's blobby molecules, Nishimura et al's Metaballs and Wyvill et al's soft objects. 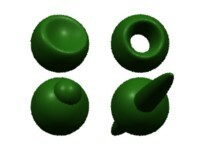 Blobby models are built from simple primitive shapes (ellipsoids and sausage-like cylinders with rounded ends in the current implementation) blending together into rounded, tubby, globular masses. They are best used in situations where users want to model amorphous shapes and are willing to trade away fine control over details of shape for ease of modeling gross features. Jim Blinn's models of complex molecular structures and the splatting raindrops in A Bug's Life are good applications of Blobby models. The most important feature of blobby implicit models is automatic blending. Blobby shapes placed close to one another can be blended together (or not, as the modeler wishes) with no need for modelers to construct explicit round and fillet patches joining them. 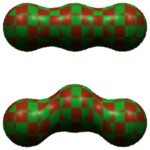 The two objects in the picture to the left contain identical clusters of spheres: unblended on the left, blended on the right. Blending is not an all-or-nothing proposition. For example, we can model a blobby hand to blend the fingers into the palm, but completely prevent fingers from blending into one another. The picture below shows an extremely ugly space-alien hand, first with no blending, then with all ellipsoids blended together, then with selective blending to prevent webs from growing between the fingers. RiBlobby also allows modelers to attach values of any Shading Language type to individual blobs. These will be blended appropriately and passed to surface and displacement shaders in the usual way. The image on the left shows the same two sphere clusters we saw before, this time with different values of Cs given for each sphere. When the spheres are not blended, there is no color bleed from one to the other; when they are blended, the colors blend likewise. RiBlobby also has a segment blob primitive. Segment blobs are a simple sort of convolution surface (see J. Bloomenthal and K. Shoemake, ``Convolution Surfaces,'' Computer Graphics, v25, n4, 1991, pp 251-256), so they add without seams or bulges to make general tubular surfaces with piecewise linear skeletons. The surface in the picture on the left is the sum of 480 segment blobs in a toroidal spiral. 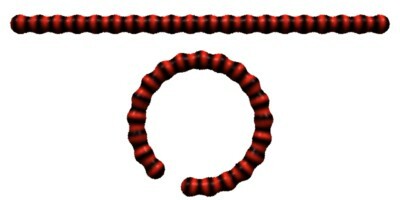 Solid-texture coordinate systems may likewise be attached to individual blobs and blended to provide global texture coordinates, as in this striped blob-chain. Each of its twenty constituent spheres has attached a transformation that carries points from the object coordinate system to a reference space. When the chain is laid out straight, these two coordinate systems are identical. When the chain is coiled up, each transformation carries its sphere back to its position in the reference space. Coordinate blending between adjacent spheres stretches the mapping just enough to keep the solid texture attached to the surface as it bends. Blobby implicit surfaces often get used to model drops of liquid that need to interact with other surfaces in the scene. As an aid for this situation, RiBlobby also allows ground planes represented as prman z-files to act as repelling surfaces. This feature allows the user substantial control over the nature of the repulsion. In this image the roundedness of the displaced blob surface, its bulginess near the ground and even how far it hovers over the repeller are all controllable over a wide range. What do you get from this? It's easier to see what's going on in two dimensions than three. The following picture shows a two-dimensional version of this field function, with a transparent plane cutting through it, creating a circular level curve. 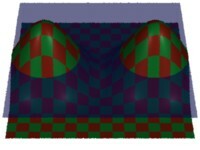 If we place two copies of this bump close to one another and add them, they reinforce one another in the region between them, creating a blend between the two individual level curves. If the bumps are far enough apart, they don't reinforce enough to move the threshold surface, so there is no blend. Of course, there is an intermediate situation, in which the bumps are close enough to influence one another, but not so close as to cause the level surface to be a single component. As the following picture shows (back to three dimensions now! ), the two components are drawn toward each other before they merge as though by a gravitational or electrostatic attraction. Of course, we can combine primitive blobs in other ways. For example, if we take a small blob and subtract its field from a larger one, we can put a dent in it. If we transform the subtracted blob to be long and thin enough, we can even poke a hole through the larger one. On the other hand, if we take the max of the two primitive fields instead of subtracting, the result is an (unblended) union of the primitive surfaces. The selectively blended hand, above was made by a more complicated combination. For each of the four fingers, the blobs describing it were added together, along with two or three adjacent blobs at the edge of the palm. A separate added-together group was made of all the palm blobs. The whole field function was just the max of these five overlapping blending groups. The code array is a sequence of machine language-like instructions describing the object's primitive blob fields and the operations that combine them. Floating point parameters of the primitive fields are stored in the floats array. File names of the z-files of repellers are in the strings array. The integer nleaf is the number of primitive blobs in object, also the number of items in each varying or vertex parameter. For all four of these operators, the operands are indices into the appropriate arrays. For opcode 1000 (constant) the operand indexes a single floating-point number in the floats array. The index of the first item in the array is zero. For opcode 1001 (ellipsoid) the operand indexes the first of 16 floats describing a 4x4 matrix that transforms the unit sphere into the ellipsoidal bump in object space. The operand of opcode 1002 (segment blob) indexes 23 floats that give the endpoints and radius of the segment and a 4x4 matrix that transforms the segment into object space. The segment blob's field is just the convolution of a `segment impulse' with the same spherical bump used for ellipsoid blobs. Add, multiply, maximum and minimum all take variable numbers of arguments. The first argument is the number of operands, and the rest are indices of results computed by previous instructions. The identity operator does nothing useful, and is only included for the convenience of programs that automatically generate RenderMan input. Let's look at an example. Here's the RIB input for the hand on the right in this picture. Vertex values that are constant within each primitive blob are fine for many purposes, but we also need to be able to specify values that change from point to point within primitive blobs. For example, we would like to be able to specify reference coordinate systems for solid textures that will stick to surfaces as their primitive blobs move. To that end, prman has a new vertex value type mpoint. The value given in the RIB stream for an mpoint value is a 4x4 matrix that maps points from the primitive blob to the reference coordinate system. The values used at each surface point are obtained by transforming points back from object space to the primitive blob's coordinates (using the inverse of the blob matrix), and thence (using the mpoint matrix) into the reference space. Thus, as far as the shader is concerned, the type of an mpoint value is point, even though a matrix is specified in the RIB stream. There are three blobs in a line. The transformations given for Pref are the same as those used to specify the object, so Pref will be the same as the blobby's object space coordinates. As you might expect, the solid-texture checkerboard mapped onto the surface is undistorted. Otherwise the shading on RiBlobby surfaces may have gritty artifacts. The calculatenormal shadeop often produces poor results. This can cause trouble for displacement and bump-map shaders. you may get bad results. This is a theoretical problem only. RiBlobby's dicing code really only works correctly for perspective projections. In every test case we've run it's done just fine in the orthographic case, but dicing-rate problems could possibly come up. Non-smooth surfaces can look nasty at their creases. In fact, this is a general problem with prman's strategy of dicing into micropolygons, but it doesn't often come up with other gprims.